Profession: Spiritual Guru/ leader, Author, Preacher or Kathakaar. Mission: Spread the culture of Gau Ganga throughout India. Gau Mata – Rashtra Mata. Did his schooling from Gurukul . 1980 – B.ED (Education) from Sampurnanand Sanskrit University,Delhi branch. 1984 – M.A in Sanskrit from Sampurnanand Sanskrit University, Varanasi. Guruji’s love and declination towards sacred Gau Mata has been an integral part of his life since his childhood and even was named Gopal. At the tender age of 12, he met his Guru( teacher) and this life changing incident gave his life a direction and marked the beginning of his spiritual journey. 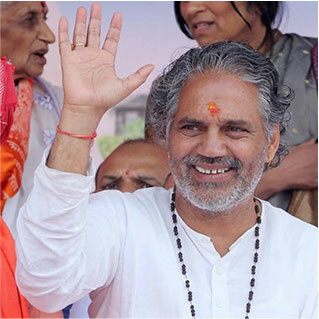 He established his very first Gaushala at the same place in Chaupadhar, Uttarkashi. Since 1984, he started Bhagawat kathas (sermons), and concluded 600 Bhagawatkatha, 400 Ram kathas, Shivpuran , Devi bhagawat, Bhagavat Gita, and preachings on other holy granths. Also, he was appointed as a teacher at Central School, Chandigarh in his early days. At the age of 25, he fasted for 11 months standing in the holy waters on Ganges, drinking only half a glass of cow’s milk once a day chanting holy verses. In the year 2005, he conducted a 6 month long Lakshya Chandi Maha Yagya or yagna in Chaupadhar, Uttarkashi with 108 Brahmins and dedicated his life in service of Gau mata (sacred cow). From 5 June 2010 to 4 june 2011, he practiced Maun Vrat i.e. a vow to stay silent in meditation. In 2004, Gopal Mani ji laid the foundation of Shree Gopal Golok Dham Rameshwari Bhakti Aashram Trust. In year 2008, an 18 day long ‘Gau Ganga Yatra’ was organized. 5000 devotees along with Gopal Mani ji travelled from Gangotri, Himalaya to Delhi on foot. He was felicitated by the honor ‘able president Pratibha Patil. In 2013, Bhartiya Gau Kranti Manch was founded with an aim to spread the message of Gau Mata – Rashtra Mata across the nation. Since 2008, regular slots on Aastha TV are dedicated to his preaching’s and rallies. In 2014, Hunkaar Rally was organized on 23rd February at Ramleela Maidan, Delhi by Bhartiya Gau Kranti Manch under the guidance of Guruji. The rally witnessed over 1 lakh devotees from different states and was a huge success. 2014 marked the beginning of state level rallies to create awareness among the masses and reach out to maximum Gau Bhakts. Gopal Mani ji has successfully accomplished his mission to unite the nation by organizing Jan Jagran Rally’s in all the 29 state capitals of India.